The Subarctic people occupied a majority of Canada from the Yukon to Newfoundland, including parts of seven provinces and two territories. The density of the Subarctic human population was among the lowest in the world. The entire area probably had as few as 60 000 people. Weather changes were extreme and game animals depended on seasons and were scarce, making life hard for many. The term “Subarctic peoples” describes a number of different and unique groups. The Subarctic region consists largely of a five million square kilometre zone of boreal forest extending from the arctic tundra south to the mountains, plains and deciduous forest in the mid-section of the country. West to east, it extends from the Bering Sea to Labrador. Three-quarters of the area lies on the Canadian Shield, Hudson Bay and Mackenzie River lowlands. It is dotted with many lakes and crossed by innumerable rivers, and consists of western mountain ranges, plateaus and the Yukon River lowlands. Most Aboriginal people of the Subarctic were organized into bands or groups of people who spoke the same language dialect and were related by kinship and common traditions. Within each of the two major language families, neighbouring groups often shared similar ways of life. Perhaps because the Western Subarctic is physically more diverse than the east, there was more linguistic and cultural diversity among the Dene than the Algonquians. Subarctic Aboriginal peoples typically lived in communities of 25-30 people. Each group moved frequently within a well-defined territory as game supplies changed from season to season and from year to year. A group's size and the nature of its annual economic cycle were strongly influenced by the availability of local resources. Most Subarctic bands did not have formal chiefs before European contact. People aligned themselves with individuals who manifested leadership and took the responsibility for specific tasks such as trading, war or communal hunting. Aside from the prestige and respect this brought them, their authority did not generally extend beyond these tasks. European fur traders, however, attempted to establish chiefs and to endow them with considerable power, in order to have better control of the Aboriginal population associated with trading posts. Kinship ties among Subarctic peoples could be passed through the mother (matrilineal), father (patrilineal) or both (bilateral). Matrilineal kinship ties existed among Pacific coast region Dene, bilateral ties were characteristic of the people of the Mackenzie River region, and both bilateral and patrilineal bonds united the Algonquian speakers. 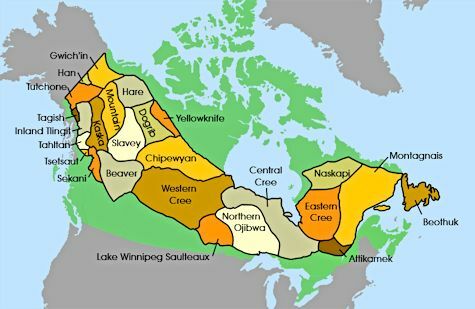 In addition, groups west of the Mackenzie River were organized into clans, and also in some cases by dual divisions (moieties) similar to those of West Coast Nations. These divisions served primarily to ensure hospitality and protection to clan members who might be visiting from other camps or bands, to fulfil certain ceremonial obligations (e.g., cremation and/or burial of the dead and reciprocal feasts) and to regulate marriage through a requirement to marry outside of the clan. The harsh environment of the Mackenzie and Yukon River Basins consists of dark forests, barren lands and the swampy terrain known as muskeg.